Oh Gayle Forman, you have done it again! 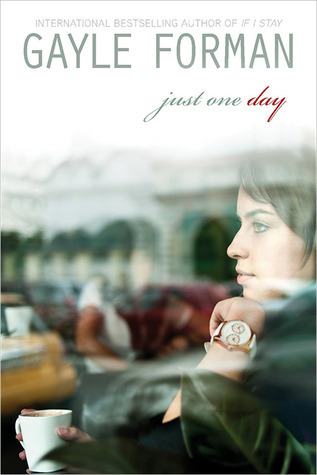 I absolutely loved Just One Day by Gayle Forman. As I have come to expect from one of her books, Just One Day is beautifully written, very emotional and was absolutely addictive reading. I put off writing this review because I just didn't think I could put into words how much I loved it. I went into reading Just One Day expecting this really beautiful and eventful day which culminates in this epic romance between two strangers ... and it is both of those things but I also loved how it's the story of a girl trying to figure out who she is and what she wants out of life as well. At the start of the story, Allyson Healey and her friend are just finishing up this European tour the summer before they're off to university and unexpectedly, they come across this troupe of actors doing a very different and open-air production of a Shakespeare play. And there, Allyson meets Willem de Ruiter, and oh my god, the attraction and tension off the two of them feels tangible right from the start. And despite being very much a planner and an organiser and despite her misgivings about trusting a stranger, Allyson decides to be a bit more reckless and she takes a chance at spending a day with Willem in Paris. This 'one day' is magical and romantic and so incredibly close to perfect for Allyson. Watching her get to know Willem and falling in love really pulled at all of my heartstrings. But after that one day, things don't go as perfectly ... Allyson wakes up to find Willem gone and the reality of what's just happened falls heavily on Allyson. Being stranded in Paris makes her both physically and emotionally vulnerable and she gets out of there pretty quickly and all those worries that's she's had about Willem up to now crash down around her. What if he was just using her? What if it didn't mean to him what it meant to her? How well did she ever know him anyway? She never even knew his last name and he never knew her actual first or last name. I'll admit that I did think that most of this story happens during the space of the one single day, and it doesn't. Because afterwards, we follow Allyson off to her first year of university and watch as she struggles to be the person that other people expect her to be. It's as though that one day in Paris showed Allyson how it felt to be free and to do things for herself and now that she's back in reality it feels as though she doesn't fit into the space that she used to occupy. Her parents and even her oldest friend are still stuck on the idea of Allyson as being pre-med and collecting alarm clocks or acting in a certain way and they can't accept that she's changed in this invisible way. And I loved watching as Allyson begins to accept that for herself and makes new friends in uni and taking classes that remind her of her perfect day, like a Shakespeare class, even if it means bringing back hard memories. I really, really loved Allyson as a character, watching her change into a more confident and happy person. I loved the element of travel within the story, both the beginning with Allyson and Willem discovering Paris together, but also that of Allyson exploring Europe on her hunt to track down the mysteries of Willem de Ruiter. I'm absolutely dying to read Just One Year, the book from Willem's perspective, and to find out what happened before and what will happen next for these two! Why oh why haven't I read a Gayle Foreman book yet? I don't think I have read one bad review on her books! I'll get a copy of this when I next can :) Thanks for sharing. Stop what you're doing RIGHT NOW, Zoe, and pick up ANY book by Gayle Forman!! I must read this now! I know that so many people love it and I have wanted to read it myself but I really didn't know much about it. I'm definitely going to buy it now! Thank you so much! You're very welcome Lucy, I hope you LOVE it. Yesyesyes. I didn’t think anything could be as good as Where She Went, but Just one Day TOTALLY blew my mind. I would really like Just One Year right now!!!!! I need it too. Why do we have to wait to find out what happens, whyyy? !